We are in the early stages of a great debt default – the largest in U.S. history. We know roughly the size and scope of the coming default wave because we know the history of the U.S. corporate debt market. As the sizes of corporate bond deals have grown over time, each wave of defaults has led to bigger and bigger defaults. Here’s the pattern. Default rates on “speculative” bonds are normally less than 5%. That means less than 5% of noninvestment-grade, U.S. corporate debt defaults in a year. But when the rate breaks above that threshold, it goes through a three- to four-year period of rising, peaking, and then normalizing defaults. This is the normal credit cycle. It’s part of a healthy capitalistic economy, where entrepreneurs have access to capital and frequently go bankrupt. In 1990, default rates jumped from around 4% to more than 8%. The next year (1991), default rates peaked at more than 11%. Then default rates began to decline, reaching 6% in 1992. By 1993, the crisis was over and default rates normalized at 2.5%. Around $50 billion in corporate debt went into default during this cycle of distress. Six years later, in 1999, the distress cycle began to crank up again. Default rates hit 5.5% that year and jumped again in 2000 and 2001 – hitting almost 8.7%. They began to fall in late 2002, reaching normal levels by 2003. Interestingly, the amount of capital involved in this cycle was much, much larger: Almost $500 billion became embroiled in default. The growth in risky lending was powered by the innovation of the credit default swap (CDS) market. It allowed far riskier loans to be financed. As a result, the size of the bad corporate debts had grown by 10 times in only one credit cycle. The most recent cycle is the one you’re most familiar with – the mortgage crisis. Six years after default rates normalized in 2003, they suddenly spiked up to almost 10% in 2009. But thanks to a massive and unprecedented government intervention, featuring trillions of dollars in credit protection, default rates immediately returned to normal in 2010. 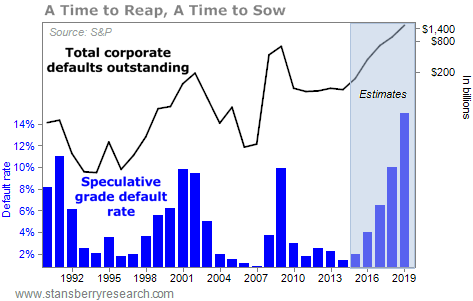 As a result, only about $1 trillion of corporate debt went into default during this cycle. You should know, however, that the regular market-clearing process of rising, peaking, and normalizing default rates did not occur in the last cycle. A massive, unprecedented intervention in the markets by the Federal Reserve stopped the default cycle in its tracks. As a result, trillions of dollars in risky debt did not enter default and were not written off. Over the last six years, this “victory” against bankruptcy and the credit cycle has led many government leaders and their economic apologists (like Paul Krugman) to declare victory. What they won’t admit is that the lack of a debt-clearing cycle has resulted in a weak recovery, and an economy that’s still heavily burdened by unsustainable debts. What happens next should be obvious to everyone: The big debt-clearing cycle that was “paused” in 2009 will make the next debt-clearing cycle much, much larger – by far the biggest we’ve ever seen. When will that happen? Six years after default rates last returned to normal. In other words… right now. The chart above shows the iShares iBoxx High Yield Corporate Bond Fund (HYG), which invests in a broad range of speculative corporate bonds. As the risk of defaults in this market grows, these bonds will begin to trade at much lower prices, causing their yields to increase. Currently, the yield on this basket of bonds is less than 6%. Look for yields to increase to well above 10% before default rates begin to normalize. That implies losses of 30%-40% are still to come in these bonds. Over the last year, HYG is down about 9%. A negative return is unusual for the corporate-bond market, especially when there isn’t a recession. And it will almost surely be a “super” cycle – meaning it will last longer and cause far more losses than most people expect. Here’s another way to time the next debt-clearing cycle. At the end of 2014, only 1.42% of speculative corporate debt had gone into default for the year – near a record low. The only better year for speculative corporate debt in recent history was the top of the mortgage-debt boom in 2006. As you know, two years later, disaster struck. 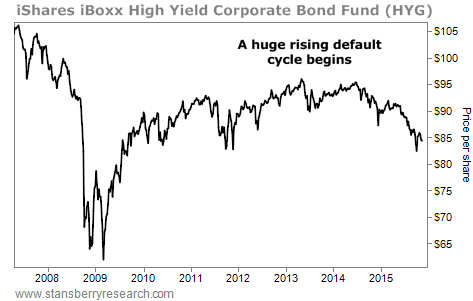 A new low for defaults in 2014 points to 2016 as the year when corporate debt will begin a new default cycle. Martin Fridson, the world’s foremost expert on the high-yield bond market, says his “base-case scenario” is for between $1.6 trillion and $2 trillion in defaults in high-yield bonds over the next three to four years. We believe default rates will be a lot worse, simply because the market has grown so much, thanks to things like CDS credit protection and the securitization of subprime consumer lending. Now, before you panic… here’s an idea you’ll see us repeat again and again over the next three to four years. What’s happening – rising default rates, rising interest rates on corporate debt, and falling stock prices – doesn’t need to be a crisis for you, personally. Instead, this period could be the best opportunity that you will ever get to buy great assets and great businesses at great prices. You don’t need to think of this coming crisis as the “end.” Instead, think of what’s happening as a badly needed reckoning. It’s simply a housecleaning. Nothing much will change. The best assets and best businesses will still be here after the storm. The only real difference will be who owns them. What’s coming is the greatest transfer of wealth in history. Over the next few years, trillions of dollars’ worth of businesses, land, resources, and intellectual property are going to exchange hands – legally, but unwillingly. More non-defaulted bad debt: nearly a trillion in Eurozone NPLs. The crisis never went away. Banks couldn’t act on the bad debt, because their capital would be insufficient. Banks want negative rates on deposits to get revenue, to cover things like this. And bail-ins. Assuming the FED does not try to pull another rabbit out of the hat……..
Of course the FED will try to pull a rabbit out of its … The question is what will that attempt look like, what will be its prospect for success. Probably there will be an attempt to set up something like Fannie for corporate bonds. Stansberry is always selling something. 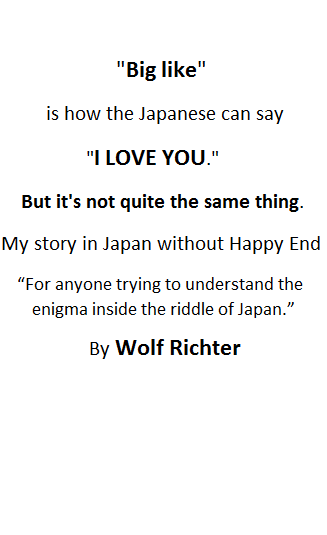 Everyone is. Nothing happens in an economy until there’s a sale. I just loaded up on popcorn and beer and waiting for the “repoman” shows to start up again. By sheer volume/value? Perhaps. By percentage year on year? Most likely not. I stand by my previous idea that this “wave” of defaults won’t be like anything we’ve seen so far. This is not going to be a brief sharp pain but a long (possibly very long), drawn-out correction, with companies dropping dead by the roadside one by one instead of in clusters. Monetary policies alone make sure the demand for junk bonds (“debt”) will remain at an all time high, and with much repressed interests to boot: today junk-rated companies lament when they have to offer 8% yields to make their bonds palatable, but I remember the days when they had to offer over twice that yield to find lenders/buyers. And I am not that old. Of course the problem is revenues are mostly stagnating if not declining and if you keep on taking on debt to service what you previously issued, pay dividends etc, even assuming interest rates remain exactly the same, you have to sacrifice a larger and larger part of those stagnating/declining revenues to service your debt. That alone ensures defaults will be coming, and a lot of them. But not in a “sky is falling” way. Of course there’s always the “nuclear” option, meaning NIRP’s so ferocious as to drive bond yields even more into the ground but at that point we’d be stepping into the Twilight Zone. The big question is, how many will be able to convince their revolving-door cronies that they are “too big to fail”? One of the best texts I have red this year. Just plain and rational thinking no gloom and doom. “…Now, before you panic… here’s an idea you’ll see us repeat again and again over the next three to four years. Hmmmm……. Was what happened in September 1929 “just a correction”? How many “wonderful opportunities” was the frugal and cautious investor able yo avail himself of? And how did the Great Depression end? Considering the terrible weakness of both the world economy as a whole and the major trading nations in particular. I fear that disaster looms and we are living on borrowed time. THE FORGOTTEN DEPRESSION, 1921TheCrash That Cured Itself, by James Grant.